FALA manufactures and ships products directly to end users on a repeat basis to a time schedule and a consistently high level of performance. We fulfill the entire supply chain -- from design and drawing revision control, to logistics, inventory, purchasing and production management. We build to meet exact specifications and schedules, including system test, inspection and product qualification. We regard Supply Chain Manufacturing essentially as one step above Precision Machine Building. Not only do we have to make it right, we also must ensure that every step in the process is tightly coordinated to meet our customers’ delivery schedules in a timely, cost effective manner. Key to good supply chain management is the process by which we execute Engineering Change Orders (ECOs). As we manufacture products over an extended life cycle, FALA consistently is updating and revising engineering drawings, enhancing software, refining assembly processes as well as continuously maintaining accurate bills of material. We implement enhancements. We overcome the obsolescence of component products. We institute cost reductions. We’re adding new customer functionality and, most importantly, we’re adapting existing product lines for new markets. In the end, we are responsible for our customer’s good reputation, since what we make and ship goes out under our customer’s name. The following are two examples of supply chain products that FALA Technologies manufactures for MKS Instruments Inc., a leading, global provider of instruments for the semiconductor, biopharmaceutical and medical industries. The Califlow is a primary standard calibration system that has been in use worldwide for more than two decades by both private and governmental metrology laboratories. The Califlow is a highly accurate instrument for measuring gas flow and calibrating thermal mass flow controllers and meters, laminar flow elements, orifices and other electrical and non-electrical mass flow devices. This version of the Califlow has been updated and packaged to include PC, monitor, control system interface options and software, which allows fully unattended operation of the instrument. Other advancements include improved safety and serviceability. The software architecture is modular, thereby facilitating modifications for special customer requirements. All measurement elements are traceable to NIST. 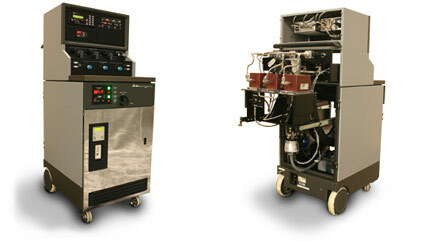 The Califlow has a wide calibration range of 1 sccm to 50 slm and a 0.2% reading accuracy. 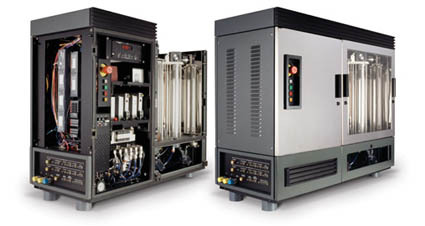 It provides continuous multi-set point calibrations without operator involvement. The LabView6i software utilizes an intuitive human/machine interface and advanced self-diagnostics. It is compatible with most electrical and mechanical flow meters and controllers. The Portable Vacuum Calibration System (PVS6E), is a software-controlled, diagnostic tool that calibrates vacuum gage instruments in situ and provides NIST-traceable calibrations for reliable, uninterrupted process performance. NIST (National Institute of Standards and Technology) traceable calibration helps comply with government regulations, ISO 9000 (International Standards Organization) and other Quality Assurance program requirements.